The time is nigh. With the World Cup begun, and upsets already happening (the Netherlands, anybody? Costa Rica?) the U.S. will be itching to finally kick off in Natal on Monday. 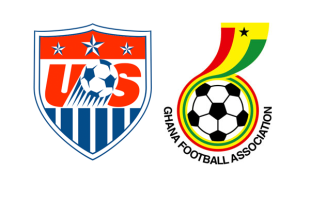 The foes, of course, will be U.S. bogeymen Ghana, killers of American World Cup dreams for two tournaments running. The U.S. seems to have settled in to a formation that is comfortable and allows Michael Bradley freedom to shine. The U.S.’s last warm-up, against another World Cup side, Nigeria, showed the team looking both secure defensively (before the subs threw off the shape), and firing on offense. Ghana, however, torched South Korea, 4–0, in their final warm-up, so are primed for this match, as well. This is the critical moment. If either team hopes to move past the group stage, a win is necessary. Which nation’s nerve will hold? While Jurgen Klinsmann was emphatic that the lineup for the game against Nigeria was not his starting 11 for Ghana, it sure looked like the U.S.’s best team. With Kyle Beckerman at the base of a midfield diamond, Jermaine Jones and Alejandro Bedoya running both ways as the nominal wingers, and Bradley at the point, the U.S. marshaled Nigeria’s attack and broke with speed, supported by Fabian Johnson and DaMarcus Beasley out of defense. A rejuvenated Jozy Altidore partnered Clint Dempsey up top, giving those counterattacks real menace. And yet, there are questions. Left back: Klinsmann clearly likes the strength and athleticism that Timmy Chandler provides on the left. But Beasley’s locking down of that side against Nigeria, allied with Chandler’s lackadaisical defending, which led to a penalty kick against Turkey, may have put the veteran back at the top of the depth chart. Right wing: Bedoya started against Nigeria, taking what many had assumed would be Graham Zusi’s spot in the 11. Both players work hard, but Bedoya offers more defensively while Zusi’s offensive toolkit is better. Whichever player starts may indicate whether Klinsmann wants to take the game to Ghana or absorb pressure and counterattack. Jozy Altidore: Altidore broke through in a big way against Nigeria. Getting first a tap-in, then the sort of in-form goal only a confident striker can pull off, his return could not be better timed. It needs to continue, if the U.S. is to have any chance. The key will be making sure he is not isolated up top, and getting him good touches early. A confident Altidore is a dangerous Altidore. The Ghanaian team will be familiar to those who watched the World Cup in 2010. That team was full of youngsters that have now matured into savvy veteran players. For an in-depth look, read Michael Cox’s rundown at Zonal Marking. The primary takeaway is that Ghana is a counterattacking team that relies on disciplined defending to support swift breaks up the wings that feed their striker, Asamoah Gyan. With the U.S. playing with a relatively narrow diamond midfield, this could pose difficulties. However, with the U.S. also set up to play on the counterattack, it may be a question of who gets the first goal. Neither team will relish the idea of trying to come back from behind, but both teams will press forward with increasing urgency as the game gets into the latter stages. A draw won’t be enough in this group. Then again, overreach and get a loss and there’s no chance at all. Barring a defensive mix-up by the U.S. early, this is liable to be a cagey affair for the first half hour, with both teams looking to see how well they match up with the other. But don’t expect that to last. If the teams are scoreless by the hour mark, expect substitutions and increasing intensity, which will only be ratcheted even further by the first score. Much depends on whether Klinsmann decides to attack Ghana or invite Ghana forward. The U.S. should be confident in their offensive ability, but with a still-gelling defense, leaving gaps in midfield, as against Turkey, could be fatal. This game could see a flurry of late goals, and I must be an optimist and predict the U.S. wins, 2–1. The US wins 2-1… my thoughts exactly. We are the better team. I don’t think this game is as nail biting as other think it will be. I just want to comment, a propos of your link to Zonal Marking, that between PSP, ZM, and the Guardian, I don’t really need any other football writing in my life. Well done to all!